Address: Fathehbad Road, Taj Ganj, Agra, Uttar Pradesh, 282001 . Access: 10 kms. from Airport, 5 kms. from Railway Station, 5 kms. from Bus Stand. Facilities: Double A/C 79, Double Total 79, Suites A/C 4, Suites Total 4, Total A/C Rooms 83, Total Rooms 83, Centrally Airconditioned, 1, 300, 2 Coffee Shop, 1, Indian, Continental, Chinese, Room Service, H/C running water, Telephone, Fax, T.V., Safe Deposit, Banquet Facilities, Conference Facilities, Beauty Parlour, Shopping Arcade, Health Club, Swimming Pool. Services: Doctor on call, Laundry, Money Changer, Banking, Safe Deposit, Baby Sitting, Valet. A 4 star hotel on the Fatehbad Road in Agra, Howard Park Plaza epitomizes the word 'luxury'. It not only offers great accommodation replete with all modern conveniences but also excellent service along with an inviting ambience. It has Conference facilities for the business travelers and many recreational facilities for people on holidays. Money exchange facilities, Banking and Valet parking are all available at the Park Plaza. Come to Agra and enjoy a stay at this Hotel that will win your heart and transport you to a world of pure luxury and comfort. COFFEE SHOP - Furnished in parquet sets the tone for relaxed dining. COCONUT GROVE - Overlooking the pool offers delectable South Indian and North Indian Cuisine. DOWNING STREET - The bar is just right to relax after hectic session at work. REGAL ROOM - 3500 sq.ft. Divisible into 2 halls.This provides the ideal setting for your conferences. The hall can easily accommodate up to 300 persons in theater style.A full range of audiovisual equipment is complimented by fully trained and competent staff. Contemporary aids including a variety of microphones. OHP, slide projectors, LCD Panels, Personal Computers etc. Can be made available to suit every unique conference requirement. What do you think about Howard Plaza Agra? Coldix Melbourne June 30 2008: "Loved the Marble and Massage"
Great place to stay, very helpful staff, good off season rate 2400IRU, had a Ayurvedic Massage 1200IRU, it was a great experience, the pool was still closed. They had a Marble craftsman Salim in the shop showing how they do the work, very interesting. Lovely friendly man. Breakfast was included in the price, I had the Indian it was great as well, only concern was the internet cost an extra 500IRU for 24 hrs. 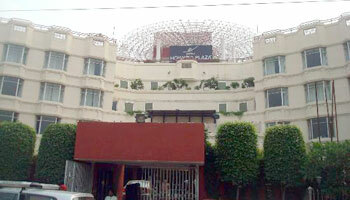 Hotel is smart, clean and well located to access Taj Mahal and Agra. After a bad hotel in Delhi, this was a very welcome relief. The Building is modern, but attractive, with a small driveway and garden area overlooking a busy traffic island. Despite this, it is quiet inside the building. The reception / lobby area is quite grand for a relatively cheap hotel, with nice chandeliers. check-in was very efficient. room was spacious and had a nice bathroom. not very indian - looked like a western chain hotel, but smart all the same. most importantly, the air con worked well, the bed was comfortable and you couldn't hear the traffic outside. Lunch in restaurant was fairly tasty and a wide range to choose from. breakfast buffet was very good with lots of indian and western choices. For a short visit to see Taj Mahal, would definitely recommend this place. Only complaint is that pool was closed for maintenance. We stayed here as part of a Golden Triangle tour - and it seems as if most of the other guests were also staying for only a brief visit. The swimming pool was not working, and the advertised beauty, hair, spa etc were nowhere to be found. The bar contained nothing but beer and whiskey, so we didn't stay there for too long! We ate in the restaraunt and found the food pleasant, but rather overpriced. Breakfast was good, with plenty of choice and the usual egg chef, but fresh food was being regularly put out, and the coffee was fine. Checkout was a disaster, the two staff on duty simply could not cope, and eventually our guide had to step in, or I think we may still be waiting to escape. Our room was large, and overlooked air conditioning units, but in the distance we could see the top of the Taj Mahal, and that made up for everything! We tried to explore the local area but found the touts so harassing, that we gave up and stayed in the hotel. Gatuska Lisbon April 15 2008 : "Nice Hotel"
I stayed in Park plaza on April the 9th and I lke it although it was average hotel, the room was clean but had I funny smell, and it seems like it need a renovation. The staff in the reception was Ok but in the restaurant they were not very friendly. To spend only one night it is ok.
Happytrails ID March 2008 : "Below average hotel, terrible staff"
The desk staff at this hotel are very unfriendly and not at all interested in helping--either with check-in, currency exchange or directions. Additionally, when we arrived, our air conditioning was not working and it took more than an hour to get moved to a room with working air and then, it was a much smaller room. No apologies on the part of the desk staff or manager. I would not recommend this hotel. Julian UK Dec 12, 2007 : "Good value in Agra"
Good to arrive at an international standard hotel in the chaos that is Agra. Reservation dealt with efficiently. Good standard of cleanliness and value for money. Not far from Taj and main sights. Very handy for Costa coffee and pizza hut if you crave western food! Rooftop restraunt very good in hotel. Harrow London Dec 8, 2007 : "Just right"
The hotel is not too far away from Taj Mahal and is excellent inside, the rooms, service, although I was rudely awake by screams and yells which I found out later was from a school located right next to my room, still, better then being next to a train station!. There is almost a top side resturant which has excellent ambience and abolsutely great food. We stayed for one night so did not get a chance to use all the hotel had to offer, but overall, very pleasant stay. Ajay Pune India Oct 22, 2007 : "very good hotel of international standard"
We stayed in this hotel in October 2007. My husband's (Vivekbrata) review covers most of our observations/ feedback. There were a few more points that we wanted to mention and since we could not find a way to edit the reviews, I am submitting one separately- please condider this an addition to his review below. Location: It's actually a very short walk (10-15 mins) to Taj Mahal. Especially good if you are planning to visit in the early morning. Restaurant and Food: The service was slow, and there was no view of Taj Mahal - but the food was great once it arrived. In fact the Biriyani we had there was amongst the best I've ever had. The breakfast buffet (complimentary) was good with a decent spread on Indian, Continental and American options. Check-in, check out etc very smooth once we arrived. The chaos before that was another story. The snacks in the room / items in minibar were charged at 5 times the MRP. Chaging a premium for serving it in the room is OK, but we thought 5 times was too much. Overall, it was a great stay. All décor and fittings of international standards. The bed was exceptionally comfortable which was a great boon after a hot tiring day in the maddenning traffic of Agra. It was great room to come back to at the end of the day. Though the Lobby does smell, and look a bit run down the rooms in this hotel are fantastic, very similar to a 4 star hotel. Staff are ver friendly. There was many power outages but I think thats standard for India. No sign of the roof top restaurant with views of the Taj they advertised, maybe it was closed but this could be a have. Good option for Agra accommodation We drove past Holiday Inn, which looked quite good. Though happy we stayed at Howard Park Plaza. From Australia Sep 3, 2007 : "A reasonable stay" This hotel was booked by our travel agent so was not of our choice. In saying this it was an ok stay. The rooms were big, service OK. We didn't eat in as we didn't enjoy the breakfast much. Our laundry did get done the same day so we were pleased with that. The hotel was pretty empty when we stayed so not many staff around though when you found them they were very helpful.